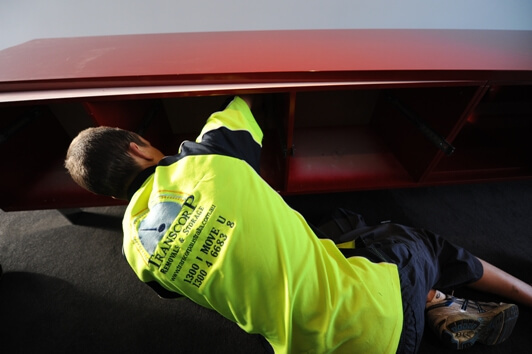 We specialise in the logistical strip out and refit of furniture (including unpacking inbound containers) for large hotel chains, motels and restaurants, including Furniture, Fittings and Equipment (FF&E). Transcorp Removals & Storage is a leader when it comes to fitouts and Furniture, Fitting & Equipment (FF&E) relocations for hotels and restaurants. With our dedicated team of experienced professionals, over 20 years of experience in hotel and restaurant fit out logistics, and the latest equipment and well-equipped vehicles, we’re able to accommodate any size hotel or restaurant project, including disposal and recycling requests of old furniture and equipment. We have invested substantially in warehousing and equipment specific for hotel and restaurant fit out relocations to make your move easy, quick and cost effective. Established since 1987, we’re an award winning company that’s also an accredited member of the Australian Furniture Removal Association (AFRA) and Self-Storage Association (SSA). Regularly performing moves for government and professional institutions, no job is too big or too small for us to take on. Request an obligation-free quote from us today! Enquire today to learn more about our hotel and restaurant fit out relocations.